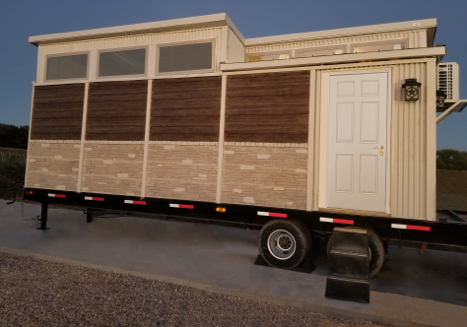 Oftentimes good things come in small sizes, and this is certainly true in the case of the precast Superior Ranchette™, a rustic tiny ranch house designed by Todd Sternfeld’s team at Superior Concrete Products. In recognition of the company’s hard work, the National Precast Concrete Association (NPCA) has named Superior Concrete Products the 2016 first place winner of the Creative Use of Precast Concrete (CUP Award) in the Above Ground Category for the Superior Ranchette. A Texas-based manufacturer and nationwide installer of precast concrete fence and retaining wall products, Superior Concrete Products created and built the innovative new home out of the company’s proprietary line of precast concrete fence panels and other products on the company’s property near the newly opened Chisolm Trail Parkway in Cleburne, Texas. The CUP Award was presented during a special recognition luncheon at the 2016 National Precast Concrete Association tradeshow in Nashville, Tennessee on Thursday, March 3rd, at 1 p.m. NPCA chairman Andy Weiser presented the award to the Superior Concrete Products CEO and founder Todd Sternfeld, and Raul Rodriguez, the company’s vice president of manufacturing. The exterior of the Ranchette is composed of Superior Brick™ fence panels which has been hand-tinted to resemble the warm weathered look of aged masonry. The posts supporting the roof of the front porch are Superior Stone Columns™ designed to look remarkably like water carved river rocks. The home’s interior has utilized Superior Wood Plus™ and precast fence panels to accent the interior of the house. Naturally, no ranch house would be complete without a fence, and the Ranchette has two. A six-foot tall Superior Cobblestone™ privacy fence duplicates the look of stacked stone, and is trimmed with the decorative Superior Lattice, a one-foot tall precast product that simulates the hand-crafted appearance of a wood trellis sitting atop the precast cobblestone. The privacy fence gives an attractive backdrop for the home’s patio – shielding the house from the late afternoon sun, while providing a welcome retreat for evening cookouts and friendly gatherings. Additional applications incorporated into the hardscape utilize Superior Rail™ and Superior Fence Caps for parking, patio and walkway paths. The Superior Rail and post fence is strong and beautiful, tricking a trained eye with its deep rugged woodgrain molded texture. Superior 3 Rail™ (4’ high) was used to build a sturdy livestock corral, while other areas of the property used Superior 2 Rail™ (3’ high) as a decorative accent to frame the front of the Ranchette and walkway around the house. Other products were used as trim and for additional accent pieces, complimenting the exterior landscape design. Superior Concrete Products, a Texas-based manufacturer and installer of precast concrete fence and retaining wall products, is unveiling an innovative new concept in home design during the 2016 World Ag Expo in Tulare, California. 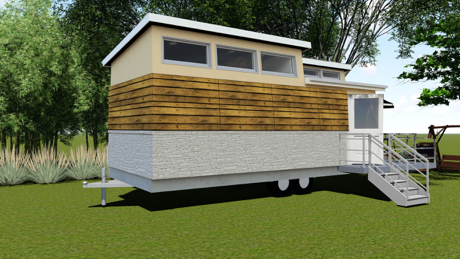 Called the Superior Ranchette™, the customizable home is a 600 square-foot tiny house constructed primarily of precast concrete fence panels molded to resemble brick and other traditional surfaces. When finished, the precast house offers the sophisticated features of a full-sized two-bedroom home, complete with granite countertops and stainless steel appliances. 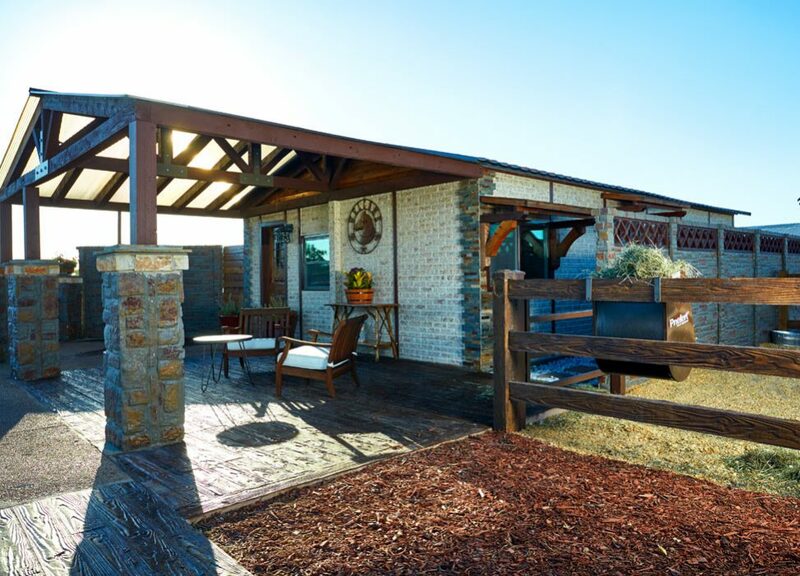 And, being a ranch, the house comes with an oversized front porch and a livestock corral. Yet, despite all of these amenities, the Superior Ranchette has a surprisingly small footprint. When it comes to home design, the Ranchette demonstrates the versatility of precast concrete as a building medium, while showcasing the depth and breadth of Superior Concrete Products line of merchandise. According to Sternfeld, all of the concrete used in the project was manufactured at the company’s NPCA certified plant in Texas. According to Sternfeld, the company incorporated many of the company’s products into the design of the house and into the surrounding property. For instance, the posts supporting the roof on the front porch are Superior Stone Columns™. The outside of the house is made up of Superior Brick™ fence panels that have been hand-tinted to a warm weathered stone color. The home’s interior is made of a deep earth-toned Superior Stucco™ fence panels that resemble the smooth textured feel of hand-troweled adobe. The outside of the Ranchette has a tall Superior Cobblestone™ privacy fence which looks like stacked stone trimmed in Superior Lattice surrounding the home’s patio for those afternoon cookouts. Superior Rail™, which looks remarkably like real wood rails, was used to build a corral for the livestock, and to create a rustic walkway. Other Superior products were used as trim and for other accent pieces to complete the Ranchette’s design. To learn more about Superior Concrete Products, the precast concrete Ranchette, or any of the company’s other innovative line of fence and retaining wall merchandise, phone 817-277-9255 or visit www.ConcreteFence.com. Todd Sternfeld and members of the company’s sales team will be in the Superior Concrete Products’ booth #DX32 located in the Farm Credit Dairy Center Building of the 2016 World Ag Expo.